409 to 439 million years ago, marine creatures were living out their lives in a shallow, highly-saline inland sea floor. Corals, algaes, crinoids, and brachiopods were abundant in the Silurian sea. The earth dried, puckered, shifted, and slowly ground its way from the warmth just south of the equator up to the 42 parallel. The hard, calcium-rich skeletons and shells of the sea creatures were fossilized into smooth, thinly layered, or laminated, dolomite stone. 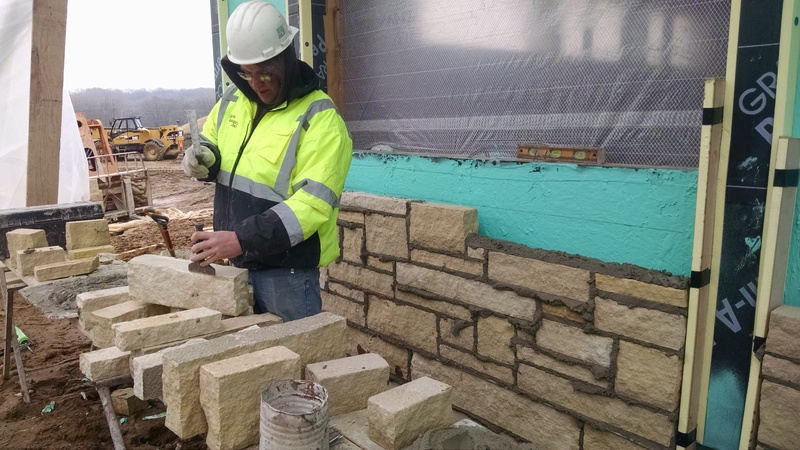 S. Moyle Masonry, of Manchester, Iowa, builds the stone veneer wall. 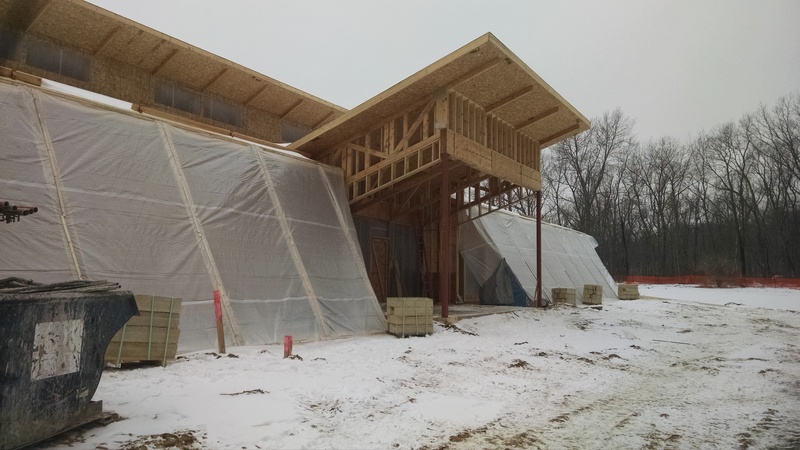 As part of Indian Creek Nature Center’s Amazing Space building, we are celebrating the natural history of Iowa. 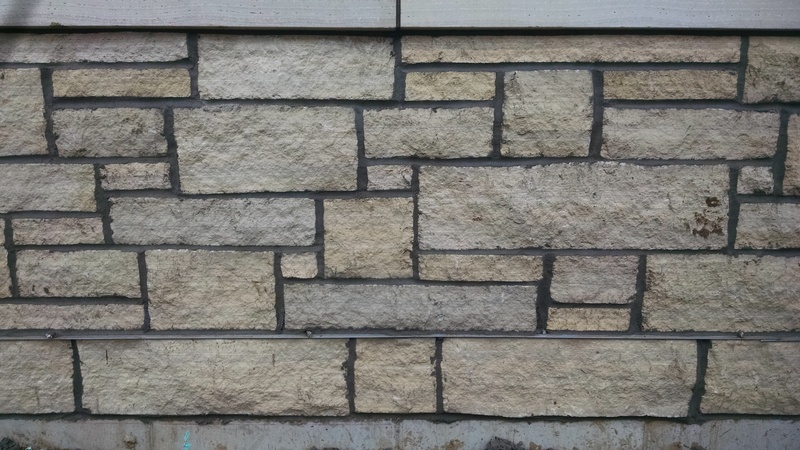 Using a stone veneer provides us with an opportunity to showcase the limestone that forms the bedrock of our region. The Anamosa limestone for our project is quarried just 21 miles northeast of the Nature Center at Weber Stone in Stone City. 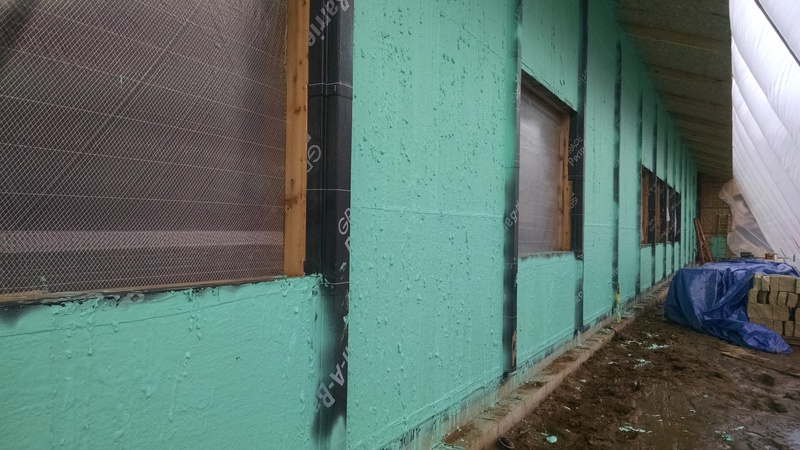 Polyextruded styrene (yellow) provides insulation between the air and moisture barrier (teal) and the stonework. 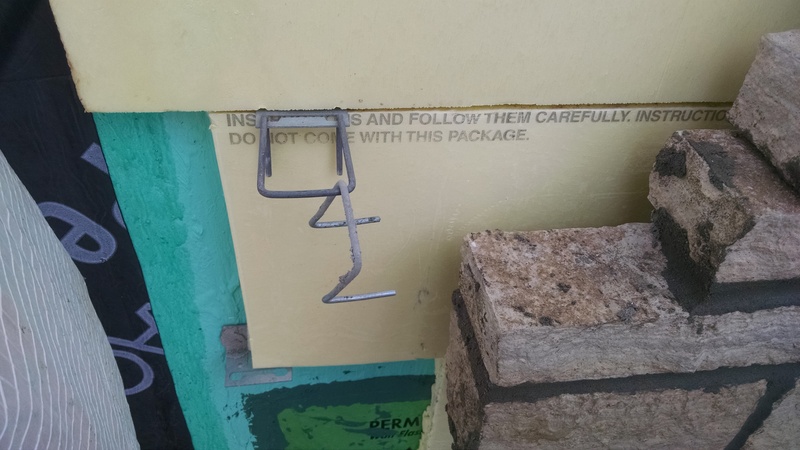 The metal bracket is set into the grout and anchors the limestone to the wall. 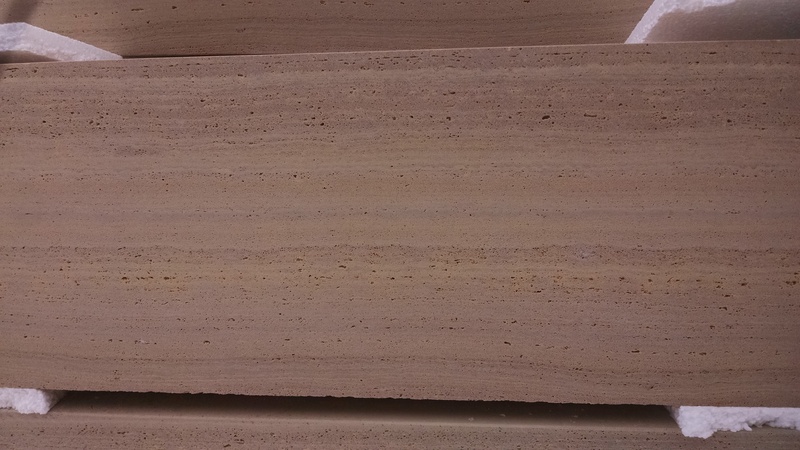 The beauty of the buff colored laminated layers, and the occasional calcite crystal, or vug, that formed during the formation of the magnesium-rich rock is evident in the natural random splitface veneer. Approximately one-quarter of the stonework has been complete. The smooth layers of the stone is a testament to the calm sea conditions of the upper Silurian period of the Paleozoic Era the organisms once lived in. 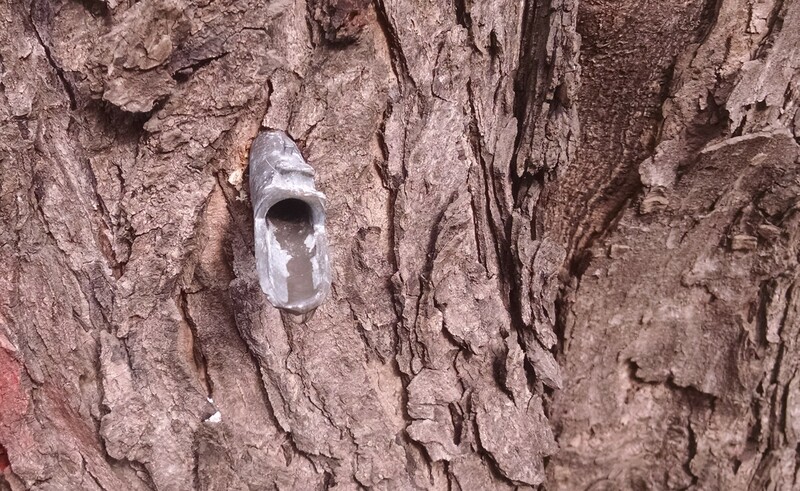 The polished caps highlight the fine texture and bedding planes of the limestone. We have finally slipped into a more typical Iowa winter, even if we are lacking a good solid snowfall. 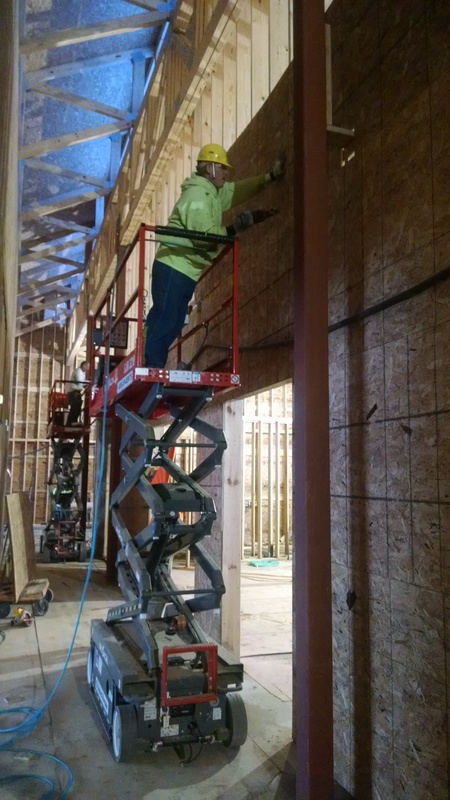 With heaters inside the building keeping it a moderate 55 degrees, progress continues. 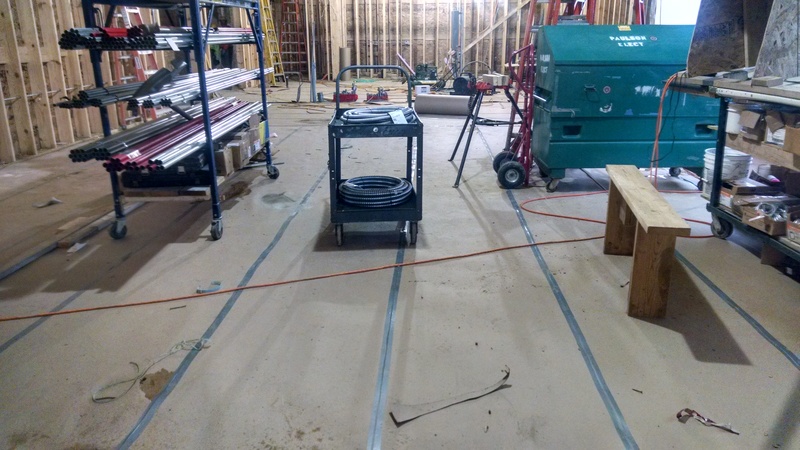 Those temperatures have allowed Ryan Companies to dry out the 4 inches of ice that had fallen inside the building before it was enclosed and install “floor board,” a cardboard-type product that will protect the concrete from damage during construction. 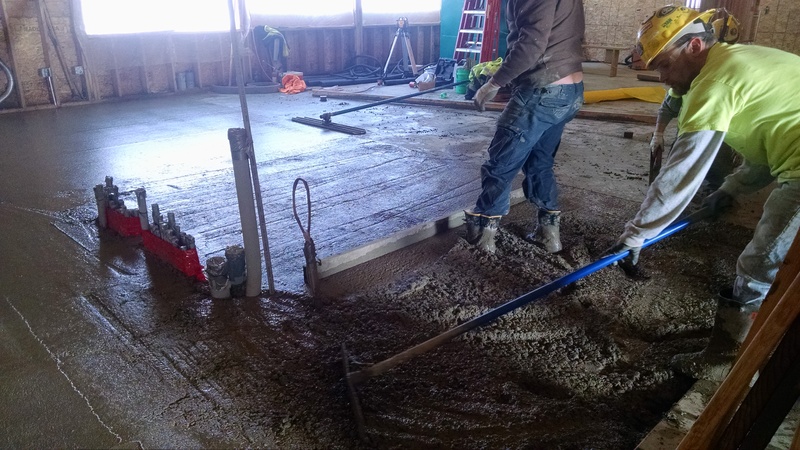 The warm air has also enabled the last of the interior concrete slab to be poured in the mechanical room and around the columns. 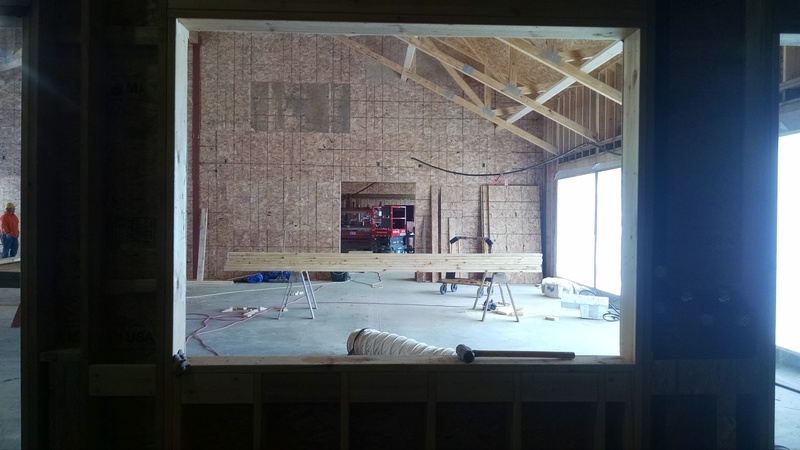 The carpenters are nearly finished framing the interior wall structures and installing the sheathing. Looking out of the pass-through window of the kitchen, across the auditorium into the main exhibit hall. 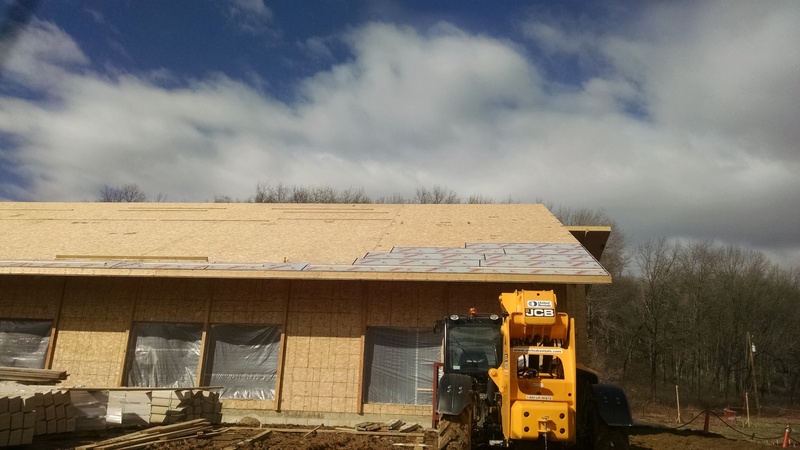 Next week, progress should resume on the exterior of the building. WIndows are on-site, ready to be installed. 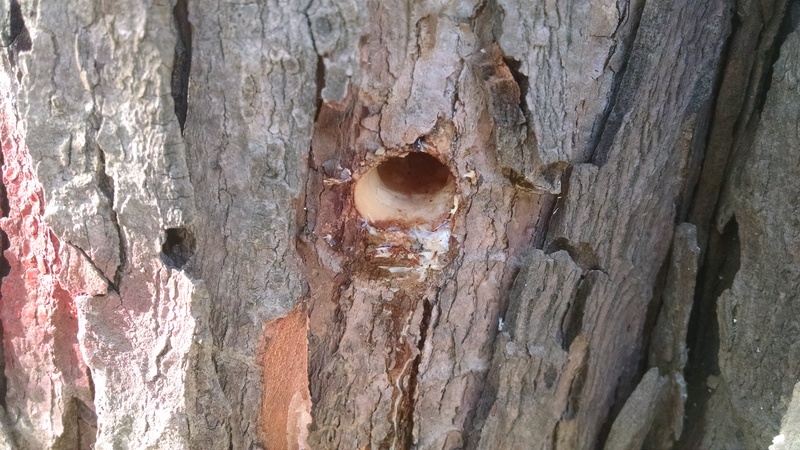 The stone masons will create a tent and heat the space, allowing them to continue working.